Construction work is often defined as one of the most dangerous professions. After all, the job includes lifting equipment, hook rigging, heavy material handling, and crane training. No matter how careful a worker can be, there will be always be hazards in the workplace. 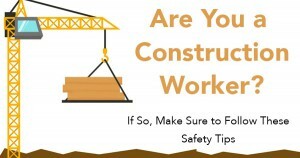 In order to prevent danger and personal injury, here is a list of safety measures every construction worker must take. You can never be too safe when it comes to checking your work space. This is especially true for scaffolding, which is the culprit behind many construction related injuries. You should always make sure the scaffold has been checked and authorized by a professional, as they will be able to notice details you may have missed. Also, it is important never to work on an incomplete scaffold that does not have a sturdy or strong base or platform. Also, don’t forget to double check your ladders. Never risk it if the ladder seems wobbly or unsteady, and always have another worker spot you in case of a fall. The best way to ensure protection on a work site is to implement a safety net. Safety nets can be used to lessen the fall if you were to lose your balance when lifting equipment. They are particularly important when working where temporary floors and scaffolds are not used and the fall distance is greater than 25 feet. Always check to maintain your electrical equipment is in working order before you turn it on, and keep an eye out for extra wear and tear within the machine. Also, if you are using a portable plugged in device, make sure to protect the cables from the elements and that the power supply is provided with an earth leakage circuit breaker. Your employer is mandated by federal law to provide you with the proper protective gear and clothing. This includes well-fitting helmets, protective eye wear, ear plugs, steel-toe boots, and protective gloves. It goes without saying that a construction worker needs to be cautious at all times. If you have any questions about these safety tips, make sure to contact the professionals at Certex USA today.